Use your finger or a stylus as your cursor. 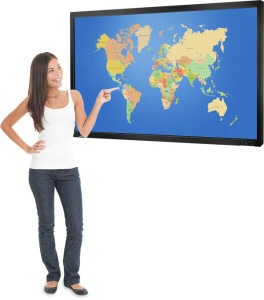 EasyTouch also supports multi-touch technology with up to six touch points, much like a smart phone, creating opportunities for group learning and interaction. LED backlighting offers improved brightness, contrast, lifespan and power consumption. Unlike other forms of lighting this technology is mercury-free; making it even more eco-friendly. Connect your laptop directly to the EasyTouch Display. *VGA, HDMI and 2 x USB ports. *All screen installations feature a dedicated wallmounted input plate. You can either run the Interactive Touch Display directly from your laptop or opt for an internal PC. Either install direct onto the classroom wall or opt for the fully portable trolley stand, allowing the screen to be moved between classrooms. Sharper images and higher contrast ensure superior readability. No annoying shadows. Designed to last 16 times longer than most projector lamps. For more information please click here to download the brochure.